The origin of these beads goes back to St. Therese of Lisieux, who as a child carried a small string of beads in her pocket to help her count the gifts she offered to God each day. 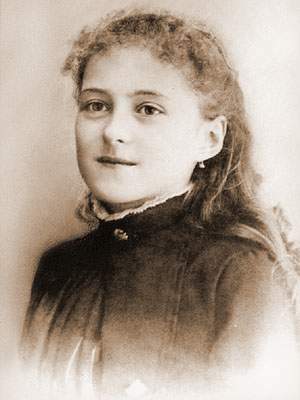 When Therese would practice a virtue, such as letting someone else have their way, or refrain from a vice, such as gossip, she would secretly reach into her pocket and "pull a bead" to Jesus. Some people push the bead towards the Saint Medal with each act of love and then sorrowfully pulling a bead back with each sin, giving the sin to Jesus on the Cross. Where will your beads end up at the end of the day? My St. Therese Sacrifice Beads (also called "Good Deed Beads") come in two varieties - a straight tenner to keep in your pocket or purse, or a round circuit to be worn as a bracelet. My Sacrifice Beads have a crucifix, a saint medal, ten movable beads and one fixed bead. This allows the Sacrifice Beads to double as a rosary decade. The 10 sliding beads will stay in place where you move them so you will not lose your place. I use a quality rosary cord for my string, and beautiful glass, wood or bone beads, finished with a lovely solid bronze crucifix and antique reproduction saint medal. For the bracelets, toggle clasps keep the bracelet in place, and are easy to open and close. Sliding knot clasps are also available upon request. The purpose of Good deed beads is to increase our sanctity by reminding us to make repeated acts of love for God throughout the day, "that we should be holy and without blame before Him in love" (Ephesian 1:4). The cross reminds us to love God; the saint medal reminds us to love our neighbor. The fixed bead reminds us that God's Will is one, constant, and unfailingly Love. The ten movable beads remind us that our choices are many, changeable, and so by repeated acts of love, we must be moved ever closer to God, or else we will move away from Him. By raising the awareness of one's good deeds, the Good Deed Beads help spur the soul on to more frequent and more devoted acts of love. Throughout the day, as the user makes acts of love to God, or to their neighbor for the love of God, he or she pushes beads along the cord as a reminder of this. The ten movable beads also remind us of the Ten Commandments, an unobtainable law until Christ fulfilled it and made it achievable in the new Law of Grace; and so the cross with Christ crucified upon it is there to remind us of the source of our holiness and our ultimate example of filial love for the Father - "obedient even unto death on a cross": (Phil. 2:8; Heb. 5:8) -- and of brotherly love for our neighbor - "Love one another as I have loved you" (John 13:34; John 15:13). The saint medal reminds us not only of our neighbor whom we are to love, but of those saints who have gone before, who by their holy lives have modeled the love of God and shown by their example that personal holiness is possible through Christ. These saints through their prayers also provide us with helps in your journey toward conforming ourselves in Christ through a more perfect love.